An interesting twist in the argument about what can be projected regarding climate, is the idea that we can only accept the empirical. Another way to state this might be 'reality vs. modeling'. It is important to understand the difference between the observations (reality - properly modeled 'observed' data) and the empirical models (generally: capable of being verified in the model and observations). Some are arguing that we should not look beyond the empirical evidence. This is a serious problem because ignoring models ignores relevant information pertaining to known feedback mechanisms in the climate system. There are negative and positive feedback mechanism that are natural and human influenced or caused by industrial output. When weighed together, the overall feedback is indicated positive. This means we are warming. There are currently no known mechanisms that could counter this warming in the relevant literature concerning climate. As pointed out on this web site, climate models are always wrong. It is important to understand the difference between the observations (reality) and the relevant dynamical models (model capacity verified by testing). As always, context is key to understanding relevance. How could relying on models be a problem? In certain cases, observations are exceeding the modeling. But that is not the whole story. Climate feedback mechanisms such as reduced reflectivity (albedo), Arctic Amplification, changes in oceans and land biology and chemistry, etc. are indicating strong positive bias as global warming progresses. To say we should only believe empirical research is the same as saying: 'I don't believe the basic physics'. This would be akin to believing the earth is flat. The basic physics are well known and easily quantifiable. Some areas of the science and physics do have higher uncertainty though. In such a case one needs to understand the confidence interval (CI). The amount of confidence that can be assigned to the application in question. In this sense, trusting models 'does' need to be looked at more cautiously. The context is between the basic physics that are either virtually certain or have high CI, and the applied physics that have low CI. You need to know what you are looking at. The first graph below is an update of Rahmstorf et al., Science 2007, ('Note the comparison is with IPCC TAR projections, but since AR4 projections are within 10% of the TAR models - this makes little difference.' - Gavin Schmidt). Actual sea level rise observations are riding above the upper range of the IPCC model. This is generally because IPCC does not factor in things they can't quantify and thus 'some' relevant reality is factored out (given a zero in the model). Therefore those models can not reach as far as the observations. The fact that the observations of sea level rise (SLR) and arctic ice extent loss are exceeding the models is an important factor in understanding the difference between modeled expectations, empirical evidence, and empirical evidence plus the known feedback mechanisms. Reasonable expectations must include context in, the models, the evidence, and the feedbacks. The fact that the ice is melting faster than established models can currently predict is another example of why we can not just trust Climate Models. Dynamical modeling, in certain instances, does not include feedbacks that are not understood well enough to be included, thus those relevant mechanisms are given a zero in the model. Therefore those models do not show what is really going on, but rather what is understandable from the limited view of the model. Even a limited view can be interesting and contribute to the science. Climate indicators are pointing toward increases in the estimated rates of change, rather than decreases. Global warming effects might therefore be reasonably expected to go faster than the some models indicate. Some models indicate lower warming potentials. As the physics become increasing strengthened confidence in various models will increase. Uncertainty will remain until the maths and physics can catch up. Although it seems contradictory from a point of view not considerate of all the available science, we need to trust the observations in certain relevant areas where we can see the evidence trends combined with current understanding of the feedback mechanisms. The current understanding is also indicative of their potentials. As long as there is attribution (known cause) and expectation (relative understanding of the feedback mechanisms) we can reasonably state that the indications are reasonably clear. The science takes into account the cause and effect. Understanding the attribution (cause and effect relationship) is critical to establishing the basis for projections. Understanding the potentials (projections) based on the established science allows for probability to be examined. It is not unreasonable to project ramifications and impacts based on on the combined modeled and empirical data, especially when considered with the feedback mechanisms. 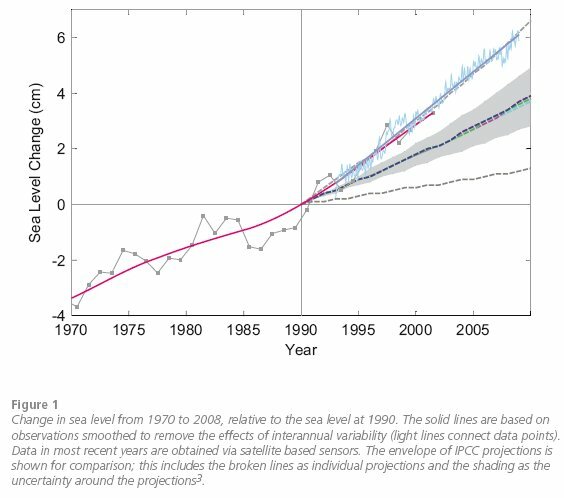 Since sea level rise is going faster than modeled projections are capable of accurately calculating, it is therefore relatively easy to project that sea level rise will be higher than estimated in models based on observations. Similarly, ice extent loss will go faster than models are able to project from a strictly modeled (capable of being verified in the model) point of view. These are very good examples illustrating why significant emphasis on reason and common sense is important in order to understand projections and implications in climate change. But it is the science and the modeling, even the weakness of climate models that shows us where important issues exist. Global warming is happening faster than models can predict at this time. This supports the basis that accelerating economic and security challenges, if not appropriately planned for will become less affordable, or likely unaffordable to achieve, unless meaningful action occurs. The combined empirical observation, feedbacks and models gives a reasonably solid foundation upon which to begin to base policy decisions that will impact outcomes regarding projected changes.